Please contact us for your specific needs. Congressional district mapping is made easy with the USgeocoder mapping engine. USgeocoder provides you 100% accurate congressional district map with the latest boundaries for the United States 116th Congress. Using USgeocoder congressional district map to create district maps with layers of your choice. USgeocoder is one of the very few companies that provide data and mapping OEM services. Our base map displays transportation network, water features, land marks, state, county, incorporate/un-incorporate areas, tribal lands, federal public lands and military installations. You can choose any of these layers to show with the congressional districts. Integrate your own data to display on congressional district map. For instance, a research group wanted to show Congress the number of businesses in their districts that were Internet based. We developed a custom map that makes the density of businesses per district readily apparent. and a host of specialized applications. Looking for congressional district mapping service for your own application? We love to hear it! Please call 1.888.938.6732 or send us an online inquiry. Take a test drive on our Live Demo. It will mark the location of the given address on the map. 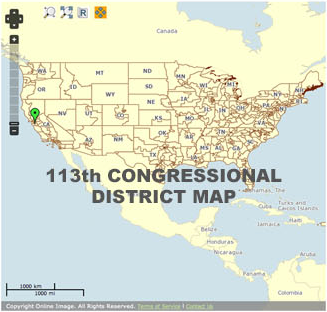 You can turn on the 113th congressional district layer to see its district and the district map for the entire nation as you zoom out. Copyright USgeocoder LLC. All rights reserved.